Connect your Roost device – How can we help? Newer Roost devices connect to your Wi-Fi network using a silent connection method. If you have an original Roost device, your device can only connect by audio provisioning. Follow the instructions in the Roost app if you do not find the "Roost-device-xxxx" network. 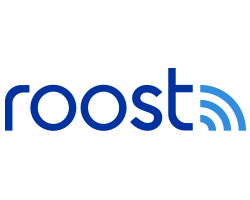 Follow the instructions in the Roost app, taking careful note of the step where you leave the app to connect to the (temporary) Wi-Fi network "Roost-device-xxxx" After you connect to this network, return to your Roost app and follow directions to complete the setup. Select '+' at the bottom of the Roost app to add a new device. NOTE: You can have multiple physical address locations in one Roost app. Please be sure to add devices to the correct address. In the example below, the device would be added to the address "Vacation Home." Swiping left or right on your screen will take you to additional address if you have them set up. Please be aware that the first time you add a device at this point, the Roost app will ask you to “Allow Roost to access this device's location.” We recommend you allow the application to see your location. Allowing Roost to know your location will let others know if you’re near the device when it sounds. Tap on the appropriate device icon. Next, indicate the location where your Smart device will be placed. You can add a custom name for a location if desired. You can always change this later. Note: If you select a Custom Location, you will need to name your location and your device. For example: Location "Attic" and device name "Water heater." Leak Detector: If you select the location of Kitchen, Bathroom, or Master Bedroom, you'll be given some optional device names, such as Sink, Dishwasher, Refrigerator, or Toilet. You can also choose a custom name such as "David's sink" or "Master bath Toilet". If you select a location of Hallway, Hallway-Upstairs, Basement, or Garage, you will need to name your Leak Detector, for example, "Hot Water Heater" or "Laundry Sink." At this step you will leave the Roost app to go to your Wi-Fi settings and make a temporary connection to the Roost-device-xxxx network. Return to the Roost app. Select your Wi-Fi network (if it is not pre-filled) and enter your Wi-Fi password. Follow the remaining set up steps in the Roost app. Tap "Try Again." If you are still not getting a Success screen, note the number of beeps (0, 2, 4, 6 beeps are error codes) and refer to the Help Center article: My Roost device is beeping during set-up, what does this mean? What do I need to set-up a Roost smart device?